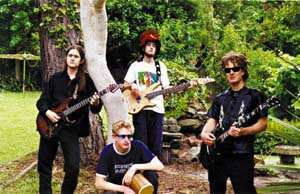 SINCE their humble beginnings in January 2000, Sydney band Wizard have been giving it all they have got. The zany four-piece creates a fusion of psychedelic metal with jazz elements and has a broad list of influences that explains their diverse style. With influences ranging from Bob Marley and Midnight Oil to Radiohead and Black Sabbath, Wizard is one act that could easily be described as mind-boggling. The band released its debut album Cosmic Saga this year and will support the album with a gig at the Northern Star Hotel on Saturday night. Wizard originally began performing under the name Flashkats and performed regularly throughout Sydney. Flashkat's EP Cosmic Cat Fight was released and a track from the album titled So Cool Circle gained 15th place out of 700 entries in the national Rock-It Competition. Wizard achieved another feat when they won the Beachcomber Hotel's Xposed competition. Saturday's show will mark Wizard's first Newcastle show, something that the band is looking forward to. Singer and guitarist Dion Palumbo visited Newcastle 18 months ago and has fond memories of the trip. 'I remember singing Elvis' Suspicious Minds with a local band at about 3am and the next day and night we went to almost every pub,' Jumbo said.